I'm very sorry for my lateless on my next post, my life has got the better of me and this blog challenge didn't turn out very well but anyway here it is and hope you like it. 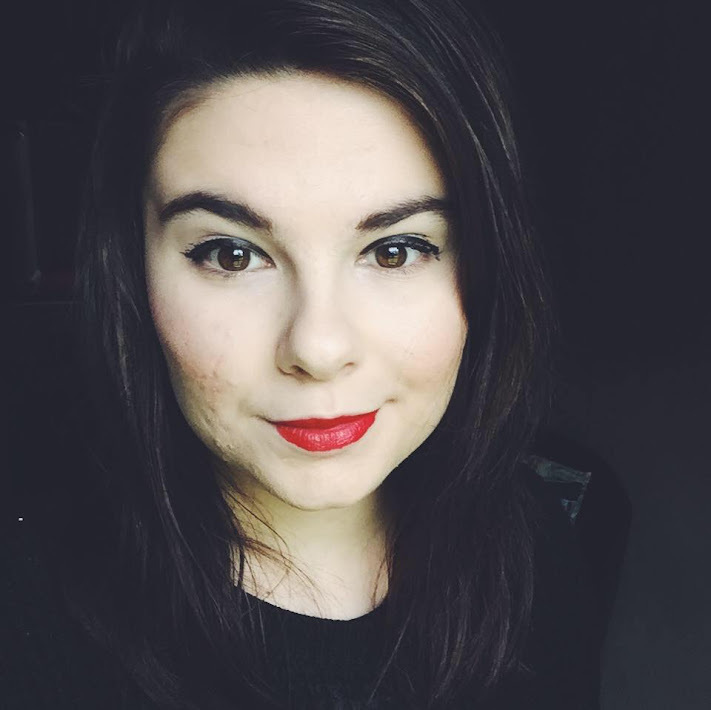 Last week I did a post about 'what was in my make up bag?' tips and advice: Face make up: foundations. but today I am going to do one for... Powders! Bottom right: Rimmel Match Perfect Compact Powder. It is very lightweight and creamy so it is not too harsh on your skin. For anyone who suffers with skin problems this would be ideal. It is lovely and blendable to give you that perfect finish to your face and will match your skin tone nicely. I love this one as it is compact and easy to carry around in your bag, it comes with a sponge for even application and has a secure lid. It is available in 4 shades: Classic Beige, Soft Beige, True Ivory and Ivory. Bottom left: MUA Mosaic Blusher English Rose blusher. I love this blusher as it contains for different shades which when blended together gives you a lovely rosy cheeks. It doesn't come with a blusher brush so you will have to buy one for this. Swirl is around the palette lightly for a natural look or use more for a more dramatic look. This is great on all skin types as it will adapt to your skin tone. 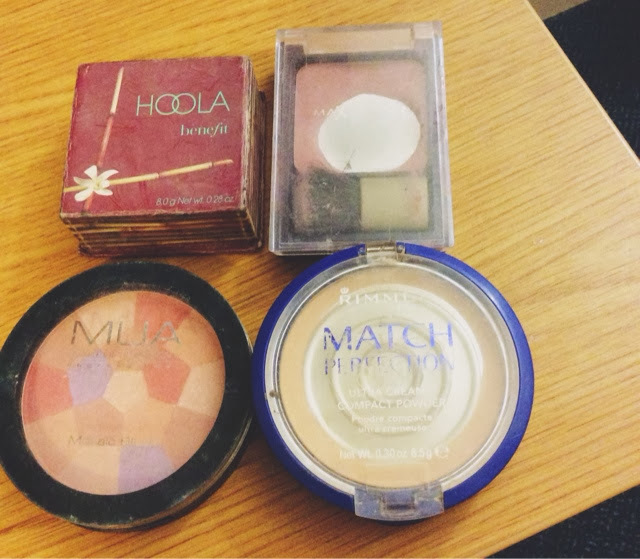 Top left: Benefit 'Hoola' Bronzing powder. I SWEAR by this bronzer, I love it so much. (Hence the capitals ahaha) it is quite expensive compared to the other products shown but it is definitely worth the money and I would recommend it to ANYONE. This bronzer gives you a natural looking 'tan' all year around. It really is the perfect cosmetic to have in your make up bag. It comes in a secure little box with a soft cheek brush. What more could you need! Top right: MaxFactor Flawless Perfection Blush. I love this blusher, it's soft texture blends easily and is not too harsh on your skin. It gives your cheeks a natural, gorgeous glow but not too strong. It is long lasting, comes in a compact case with a little brush. Another great accessory for your handbag.Can be applied on bare skin or over make up for a lovely complete make up finish. Prices may vary, prices on here are RRP. 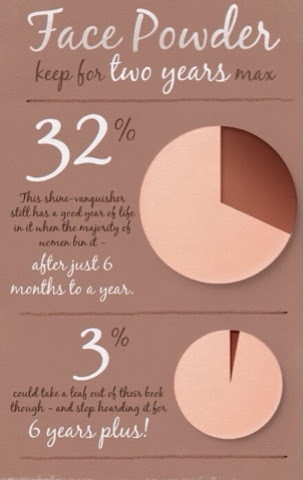 Here is a picture explaining how long you should keep your powders for! 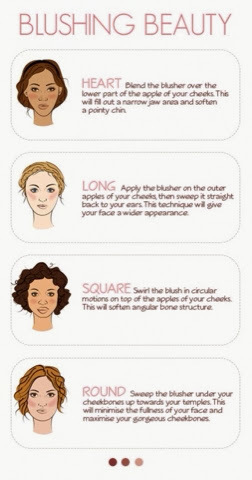 Different ways of applying your blusher!